Boil the Chick peas and set aside. After the cumin seeds crackle, add ginger garlic green chilli paste, and saute for a few seconds. Add in the chopped onions and saute until they are golden brown. Add in the chopped tomato and add about a cup of water. Make a paste of poppy seeds and cashews and add the paste to the simmering mixture. Also sprinkle some turmeric. Sprinkle salt, red chilli powder, garam masala powder, tamarind extract, the cubed potatoes and boiled chickpeas. Mix well and pressure cook for 15 minutes (2-3 whistles). Remove from heat. Upon cooling adjust the taste and garnish with coriander leaves. For Day 2, week 4 of BM #45, here is another popular North Indian side dish. 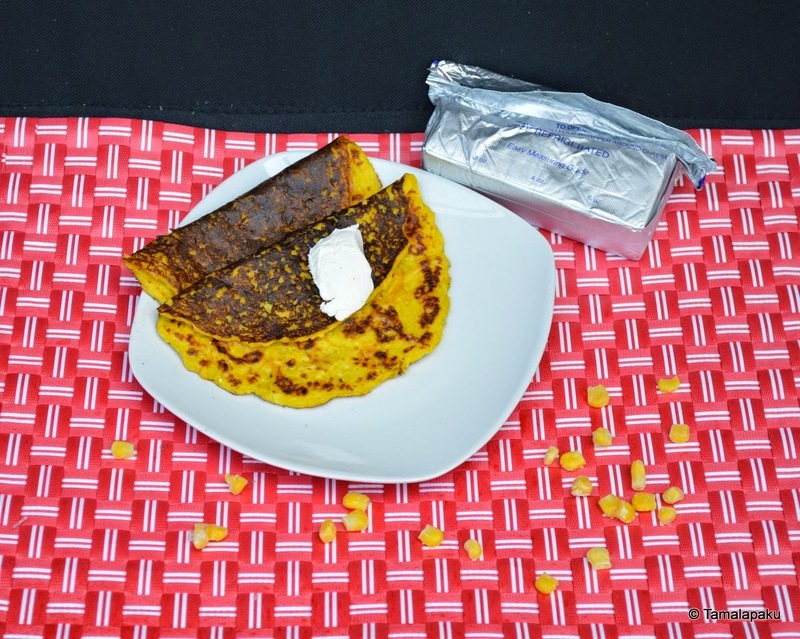 This is favored by most of the kids in our friends circle and so is a standard party dish! In a heated pan, add oil and cumin seeds. After they crackle, saute the onions until they turn slightly brown. Add in the ginger-garlic-green chilli paste, turmeric powder, tomatoes and tomato paste. Also pour in 4-5 tablespoons of water. Let the mixture simmer until the oil floats on top. Remove from fire and let it cool. Upon cooling blend into a smooth paste along with cashews and transfer to the pan. Let it boil. After the onion-tomato mixture comes to a boil, add the peas, kasuri methi, garam masala, dhania powder, red chilli powder and salt. Garnish with Cilantro (coriander leaves) and serve warm with Roti/Kulcha/Naan. For Week 4 of BM #45, I have chosen to highlight some North Indian Side Dishes. I make this chole in another way as well. Here is one nutritious and flavorful dish which is approved and loved by my family. I like to pre-treat the kala chana like I do for the regular Chole Chana. Pressure cook the Kala Chana and set aside. In a sauce pan, add a tsp of oil and saute the finely chopped onions until golden brown. Saute the ginger, garlic and green chillies as well. Add the chopped tomatoes and tomato paste, along with water. Add in the spices (Dhania Powder, Red Chili Powder, Garam Masala and the powdered masala) and salt. Let it simmer for about 3-4 minutes. Add in the boiled kala chana. (I like to grind a handful of kala chana and mix it in the gravy to get a silky gravy). Adjust the taste as preferred. Remove from heat. For Day 2 Week 3 of BM #45, here is another home remedy for the common cold. This is a good one to have at home for the upcoming winter season. I usually add this powder to the Tea I prepare specially in the colder months. Powder equal quantities (by weight) of the ingredients. Store them in an air tight container and use as required. Dosage - Boil 1 cup of water and add 1/2 tsp of the above powder. Let it simmer for a couple minutes. Remove from heat, sieve, add the sweetener if preferred and sip the hot/warm mixture once or twice a day to relieve throat discomfort, nasal congestion, runny/itchy nose etc. There are many herbs, spices and other ingredients in our kitchen which can give relief to many common ailments. [This is not to encourage you to disregard any medical advice by your physician.] So as part of week 3 of BM #45, I shall post some time tested home/herbal remedies, handed over by my MIL. For Day 1, here is a herbal decoction that has been tried by many friends and family upon the advice of my Mother-in-law. She herself takes this mixture whenever she finds there is a fluctuation in her blood sugar levels. The three ingredients are commonly available in the stores in India or they are also available online. There are many personal stories to vouch for its effectiveness which prompted me to post it as part of this series. As per my MIL, people with pre-diabetes benefit the most as they wouldn't have started any medication/insulin yet. With careful diet they can keep a healthy level of blood sugar. If you are interested check out these posts on Diabetes and Weight Management. Break the karakkaya shell and discard the seed. Crush the Vattiveru in a muslin cloth. This also ensures that the dust is cleared. Check for any impurities in Ajwain. Grind all the three into a fine powder and store it in a clean and dry container. Boil 1.5 cups of water with 1 tsp of the powder . Let the mixture boil until the water is reduced to about 1/2 cup. Cool it. A portion of the powder settles down in the container. Transfer the water into another container and strain it if required. Drink this kashayam/decoction first thing in the morning. Wait for about an hour before consuming coffee/tea/water/breakfast (whichever comes first!). It is observed that after 40 days of this regimen, the blood sugar levels stabilize. But please continue with the medication/insulin prescribed by your doctor. For Day 3 of BM #45, here is another version of chakli fit for the occasion of Diwali or any celebration! In a mixing bowl, add the moong flour, rice flour, sesame seeds, cumin seeds, salt, red chilli powder, asafoetida and ghee and mix well so the ghee is well incorporated. Fill in the murukku press with the dough and I used the star shaped plate as in the picture. Heat oil in a deep pan, and on medium heat use the murukku press to drop in spirals of dough. To get a perfect shape, some make these chaklis on an oiled plastic sheet and then gently slide into the oil. I didn't do that as I was racing against time :). I just made shapes directly in oil. Fry them until they get a golden brown hue. Drain them onto kitchen paper towels. Continue for the rest of the dough. For Day 2 of BM #45, here is another festival dessert!! This is a traditional Gujarati dessert which is a great idea to make for festivals or to offer Naivedyam(Prasad). It is a very filling and healthy snack too. I like this as very little sugar is needed to make it mildly sweet and filling. I had to make this twice on the same day as my little one refused to have her dinner unless I make this once more :). So you get the point, right? In a heated pan, add ghee and fry the wheat flour until it gives out a nice aroma or until it turns a shade of golden brown. Remove from heat and let it cool. My kids didn't have the patience to wait for it to cool, so I put the hot wheat flour and cold milk in the blender and took it out to get a lump free mixture. Put this mixture back in the pan on low to medium heat. Stirring continuously add the cinnamon powder, coarsely crushed nuts and sugar (also if using MTR Badam Mix, now is the time to add it). After it comes to a boil, reduce the heat to low. Sprinkle cardamom powder. Keep stirring to avoid burnt kheer. After about 2 minutes, remove from heat, garnish with nuts and serve warm. For week 2 of BM #45, I have taken up the theme to showcase some delightful and traditional sweets for the oncoming festival season. I am sure most of us agree that Diwali, the festival of lights, is a time to celebrate the victory of good over evil. It is also a time to celebrate it with friends and family by distributing goodies along with their best wishes. In a thick, deep and wide stockpot, add sugar and 3/4 cup of water and let it simmer and wait until the syrup reaches the one thread consistency. While the syrup is simmering, fry the cashew bits and raisins in a teaspoon of ghee and set aside. Remove the syrup from heat after it reaches the one thread consistency and add a pinch of edible camphor, fried raisins and cashew bits. Mix well, cover and set aside. In a wok/kadai, add oil and put it on medium/high heat. It also helps if the wok/kadai/sauce pan is flat bottomed and wide too. To test whether the batter is of the right consistency, using the tail of a spoon, gently put a drop of batter in the hot oil. If the resultant boondi floats on the top immediately and is round in shape and feels light, we have the right consistency. Otherwise add a teaspoon of water at a time while testing, to get the right consistency. If the batter is too watery add some more sifted chickpea flour. Remove from oil once the tiny bubbles in the oil disappear and the boondi changes the color slightly. We don't want the boondi to be bright brown. As and when the boondi is done, transfer the boondi into the stockpot containing the syrup. After couple of batches of the boondi, mix the syrup so all the boondi gets soaked in the syrup. Continue until all the boondi is done. It is very important to note that the syrup should be warm or as hot as can be tolerated by the palm of our hands. The whole stockpot might and can be reheated for a few minutes if needed. Take a handful of the syrup soaked boondi and squeeze well to form a laddu. If the syrup is not warm enough it might be difficult to make a firm laddu, otherwise the laddu making is a breeze. Continue making the laddu until the boondi is exhausted. Let them air dry for a few minutes giving it time to firm up. 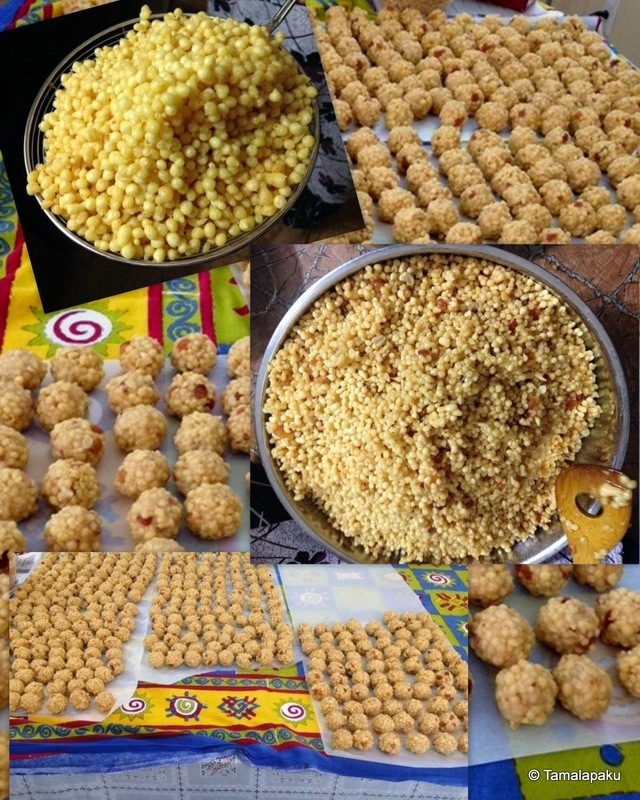 A special note - A group of 3 friends and yours truly have made a huge batch (about 370+) of laddus as a collective effort. It took us about 4-5 hours, 16 cups of besan, 16 cups of sugar and approximately 3 liters of oil, 3 cups of raisins, 400 gms of cashew bits and 1/8 th tsp of camphor. For Day 3 for the Kid's potluck party, here are some cupcakes. Can kid's party ever be complete without a cake? A resounding 'NO' from my kids :). So to please my kids, here are some cupcakes which they enjoyed with their favorite toppings of frosting with sprinkles! All the frosting was done by my older one. Note - If the cup cakes are being consumed as is without any frosting, then increase the sweetener as needed. These cupcakes are just about sweet with the frosting. Also add a little more milk (upto 1/4 cup) as the cupcakes were a tad dry to my comfort. In a mixing bowl, sift the self rising flour along with cinnamon powder. Mix in the grated carrot and apple and set aside. In another bowl, add the liquid ingredients (Milk, apple cider vinegar, honey and oil. Pour into the flour and stir well until just combined. Don't over mix. Preheat the oven to 375 °F. Prepare the muffin plates by arranging the paper liners in them. I used 24 mini muffin plate and 12 regular muffin plate. Pour the batter into the muffin cups making sure they are 3/4 ths full. Bake for about 15 for the mini muffins and 20 min for the regular muffins (or until a tooth pick comes out clean upon testing). Upon cooling, frost them as required and serve.